Oh if only this week's challenge would be taking place in a few weeks when I would be in the city of the inspiration! But it's ok, I was still ready to take on the task of being inspired by Las Vegas. Vegas is just a short plane ride from the Bay Area so I've had many a trips there. A lot when I was a kid (I know, not exactly a family destination, but they did try for a while), more in my 20's, and now we try to make it out there at least once a year or so. Our annual trip is coming up, so we can hopefully see some Cirque du Soleil shows, enjoy some ice cream from Serendipity, and of course, people watching. I purchased the fabric used in this challenge back during my first visit to Britex, the uber (expensive) fabric store in San Francisco. This fabric was on sale in their remnants section, and for as much as I liked the busy print, I haven't been able to find the right inspiration for it. But it was the first idea that popped into my mind when I heard Vegas. It's a pink and green print on a black background. Busy and bright, like the Las Vegas strip at night. 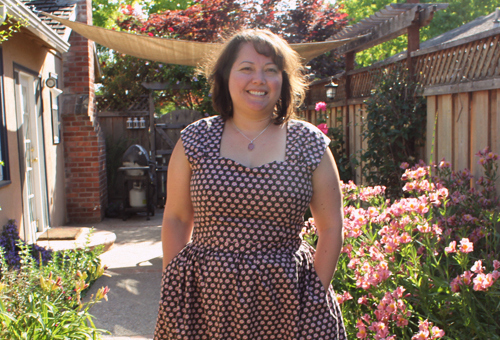 I had enough fabric to make the new Sewaholic Cambie dress, which would be the perfect dress for a day of shopping and people watching in Vegas. Oh but the nightlife in Vegas is what it's all about! 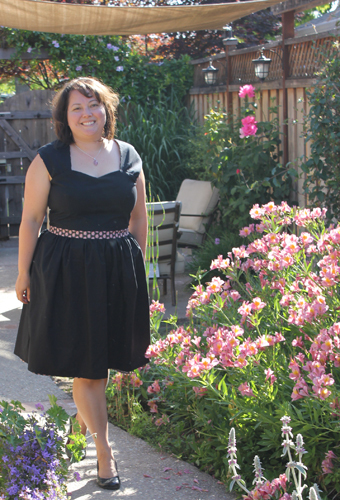 Early on in the assembly of this dress I realized that the black fabric I was using for the full lining, would be the perfect LBD. And wouldn't it be great if this dress could translate from day to night? Now, I don't know if I would actually wear it all day and then turn it around for the evening (especially in Vegas humidity), but I do like having options. Aside from the fact that you essentially make two dresses, this was about my usual 5 hours of sewing time. I had to be a bit more careful when it came to attaching the lining and hemming the dress, to make sure that it could be worn inside and out. Oh my goodness - this is BRILLIANT! What a fantastic idea! And I am so glad that you waited for the right project for that fabric - it is just perfect. Thanks so much! And isn't it funny how it works out that way? I literally had no idea what I was going to do with the original fabric. I love when you're able to transform something like that into a garment you love! I love that dress and it looks great on you. Maybe less of wear it all day and all night and more half the packing but twice the options! Thanks Andrea! I'm working on my second version in the alternate view and I don't plan on making it reversible either. My original intention for this one was just to be one sided, it just worked out so well in this case. Good luck with your dress! Thanks Madalynne! And yes, watching stuff is the only way I can do it stress free! Though I think it may add to my sewing time at points if I stop to watch particular scenes :) I can never watch anything that requires too much thought, thus there are a lot of comedies going on. I just got the pattern, do you think it was hard to sew up? It was so easy to sew up! The most challenging part was the enormous amount of gathering in the skirt. I recommend breaking it up into three sections as my thread kept breaking when I just tried to gather across the entire expanse. But I really liked the construction of the top and attaching the lining to the outer dress. And the insertion of the 'sleeves' into the bodice was ingenious - I think I even made an exclamation when I did it because I was so excited about how it was done. Great dress and idea to make it reversible. 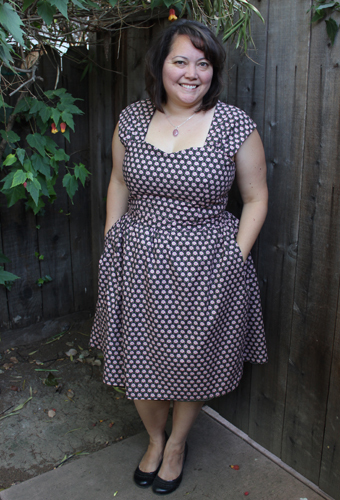 How did you treat the zipper insertion as a reversible dress? That's a wonderful idea! I'll have to get that pattern at some point! Could you add a post about the zipper insertion? I have a maxi dress that I really want to make reversible, so my options are to "Mena" it and see if I can shimmy in without a zipper, or do what you did. Thanks muchly for the help and for the oatmeal cookie recipe from this morning. I'm making it later and can't wait! I just found your blog. I love this dress. You did a great job. I understand the contemplation process. I have made reversible items before, and it does take a little time to think through the logistics. Again, beautiful piece of work. I have a blog hop on wednesdays and would love to have you link some of you clothing pictures and also some of you recipes. Bravo! What a great idea! You really do independent pattern makers proud. Great idea! I love how this came out and am excited to make (a nonreversible) version for me. Awesome job! OMG! That is so cute! That pattern, more than anything, makes me want to sew again Not enough to actually do it, but close! Wow!! What a great idea and what a great work!!! Just read about your reversible Cambie on Tassia's blog. What a neat idea. How did you insert the zipper, and did you put pockets on both sides (Tasia brought up those questions). The dress looks really nice on you, and the fit is perfect. On your next version, you might try her other idea of having the neckline straight across to give the dress a slightly different look. As to gathering, have you tried using dental floss instead of thread? It works wonders and is especially great when gathering big sections. As it was a very busy print and a black dress, the zipper on the print side is very much invisible, and on the black side you don't really see it anyways because I sewed it close to the teeth and the zipper matches the fabric. Well done! i really like your clever reversible idea. And the fit is spot on. Oh, the dress is lovely! And what a fab idea, two dresses in one! Very nice and original Looks beautiful on you! Saw your dress on Sewaholic! So very clever, and gorgeous to boot! I'd love to do this with a dress. How did you manage the hem? It's usually the hardest part for me after zipper insertion, and I shudder to think someone might SEE it! LOL! Thanks!